Create schedules for people, assets, equipment, and plan out the next week, month, year. Build alerts and link them to your schedule. Atom allows users to schedule people and things as well as track real-time the completion and return on investment of the schedule. Atom allows users to schedule work for maintenance, inspection, asset management, utilities, facilities, emergency response, transit, and other workforce applications. 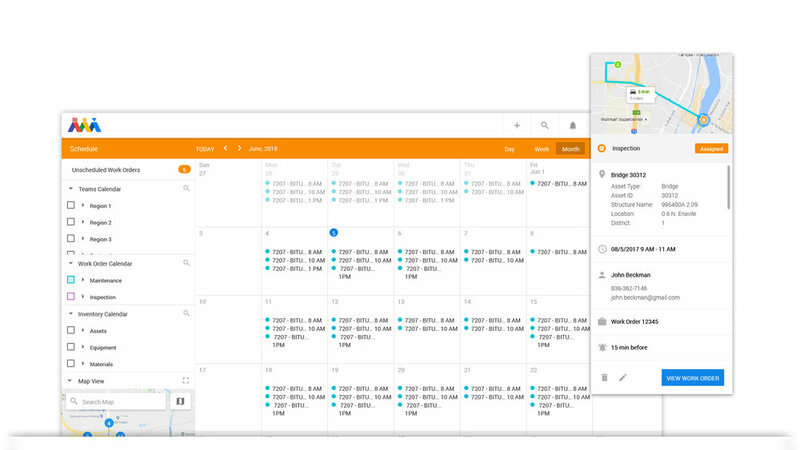 Users can sync their calendars with Google, Microsoft, and other scheduling platforms. View work and assets in a map, in a calendar, in a board, or in a list display. Atom allows users to view work on a calendar format while linking it to a map, cost, and other items. Managers can assign work for the year while enabling field users to manage their calendars on a weekly basis. Atom can automate scheduling based on availability, skill set, permissions, and location. Atom will route users in the most efficient way according to traffic and priority of the work. Field users can now complete more maintenance work, inspections, and other field work on time or ahead of schedule.